During the 800s the Vikings of Scandinavian were exploring lands across what we now call the Norwegian Sea. About 982 Erik the Red, the Norse man, discovered Greenland (Grønland). According to the anthropologist and the Genesis account of the Bible, civilization began in the Fertile Crescent (Tigris-Euphrates Valley; Mesopotamia – modern Iraq). By about 1900 BC tribes had migrated from the Tigris-Euphrates Valley into the six livable continents. By 1800 BC, it is said that the Saqqaq came to Greenland from Siberia through Northern Canada; but died out about 800 BC. And after them, Paleo-Eskimos (pre-Inuit) had migrated to Greenland approximately 500 BC. The Inuit (‘the people’) or more specifically the Greenlandic Inuit are descendants of the Thule (Qaanaaq) and the Dorset (Paleo-Eskimos). Yet, according to a 2014 DNA Study by the University of Copenhagen, all the Saqqaq and Dorset bundled together as Paleo-Eskimos, representing a single genetic lineage which had migrated across the Bering Strait from Siberia. It confirmed that present-day Inuit people came from a distinct wave of migration beginning around 1,000 years ago. In 826, Harald (Herlold) Klak, king of the Danes (Jutland; Denmark) was, with his wife and ‘a great number of Danes,’ baptized at St. Alban’s in Mainz. About 890s the Norse established settlements in Iceland. About 935, Hakon the Good, son of Harald, became king of Norway and attempted to convert his country to Christianity. In 982 Erik the Red (Eirik Raudes – banished at the time) found Greenland, but did not return with settlers until 986. About 995, Olaf Skötkonung, king of Sweden, converted to Christianity. In 988, Russian Prince Vladimir of Kiev married Anne, the sister of Emperor Basil II of Byzantine. At that time, Vladimir was baptized and became a Christian. The Norse (Viking temporary) colonization of the Americas began near the end of the 10th century. Around 1000, Leif Eriksson (Erik’s son) sailed from Greenland to North America. In 1028, a dozen years after King Canute defeated the English, he was declared Ruler of Denmark, England and Norway. By 1030 Christianity was adopted as the religion of Norway. The Viking Norsemen left an expression on the English Anglo-Saxons and on the world, in that we get the names of many days of the week from various Norse deities. Nevertheless, in 1126, a diocese was founded at Garoar. About 5,000 Norse people lived on about 700 farms in Greenland during the 13th century. By 1261, Greenland had formally joined the Norwegian kingdom. Yet, by 1378, there was no longer a bishop there. The last surviving record of a Norse marriage in Greenland at that time was in 1408 in Hvalsey Church. Not long after this event, the Christian churches were destroyed and many Norse people were taken as prisoners. In 1397 Denmark, Sweden and Norway was united by the Union of Kalmar; but about that time the Norse in Greenland were dying out and by the mid-1400s, there was no longer a Norse Greenland colony. In 1519, Pope Leo X of the Roman Catholic Church appointed a bishop of Kampe; but was later told the diocese was vacant because of ‘the unfaithful.’ In 1536 Norway became independent of Denmark. By the late 1500s all the Norse settlements in Greenland had vanished. However, the Inuit remained, some had intermarried with the Norse and a few had received Christianity though it did not take root. In 1536, during the first year reign of King Christian III, Lutheranism was adopted as the state religion of Denmark. In 1579, King Frederik II of Denmark and Norway, after learning that English explorer Martin Frobisher rediscovered Greenland in 1578, commissioned English navigator James Alday to sail to Greenland and bring missionaries to convert it to the Lutheran Christian religion; but due to extreme weather and ice he could not land. In 1585-87 (3 expeditions), English navigator John Davis (Davys) followed Frobisher’s route and reached the strait now named for him. About 1665, the Greenlandic polar bear was put on Kingdom of Denmark’s Coat of Arms to show possession. During the late 1600s, explorers and whale hunters from Denmark, Germany and France all could be found off the East Coast of Greenland. From 1711 to 1721, the Norwegian Lutheran missionary Hans Egede petitioned King Frederick IV of Denmark and Norway to fund a mission in Greenland. Frederick IV authorized the Bergen Greenland Company (1721) to reestablish contact and sovereignty over Greenland. It established a settlement near Nuuk. And though the company went bankrupt in 1727, in 1729, Greenland became a Danish province and Egede had much influence in Greenland. In 1728, Vitus Bering, a Danish explorer commissioned by Russia, discovered the ‘Bering Strait’ between Asia and North America (Alaska’s first Russian settlement was in 1784; Alaska purchased by the United States in 1867 for $7.2 million). By 1776, the Danish government had control over all trade in Greenland. In 1888, Fridtjof Nansen led ‘the first’ expedition to cross Greenland. During World War II, Germany occupied Denmark, and at that time the United States became the custodian of Greenland – which in a since was at the time a protectorate. After WWII, Greenland was returned to Denmark, although the U.S. established a military base there and in 1943 built an airbase in Thule (during which time the Danish government forced certain Inuits to move; and note in 1968 an U.S. B-52 bomber crashed near Thule with 4 nuclear weapons on board – the Inuits are still calling for total cleanup of that site). In 1953, Greenland gained representation in Denmark’s Parliament. And in 1979 Greenland voted for home rule; while allowing Denmark control over constitutional affairs and defense. In 1989, large gold deposits were found in Greenland; and as the ice melts – more resources are being discovered and are becoming able to reach. Note, however that Greenland and Antarctica are the source of about 99% of the world’s fresh water ice. In 2003, the Danish Supreme Court rejected the Inuit appeal to close the U.S. airbase in Thule (745 miles or 1,200 kilometers below the North Pole) and return the land to the Inuits. However, in 2004, the United States agreed to modernize the airbase. Currently (2017) Greenland and Denmark are urging the US to clean up military waste in an abandoned (in 1966) under-ice missile project. In 1951, Denmark, through a NATO agreement, had allowed the US to build about 33 bases and radar stations in Greenland. Qujaukitsoq, Greenland’s Minister of Foreign Affairs said in October 2016 that the waste included ‘radioactivity, oil and PCB pollution.’ The air bases in Narsarsuaq, Kulusuk and Kangerlussuaq were turned into civilian airports. Nevertheless, Greenland officials are calling for Denmark and or the United States to clean up abandoned bases. Former Premier Aleqa Hammond stated, “We have been partners for 300 years… Denmark will still be our closest foreign relation after we become independent…” Yet, most admit that independence must involve a voluntary union with Denmark. The Danish government is responsible for about 60% of Greenland’s current budget revenue; the rest primarily comes from fishing and oil and gas. 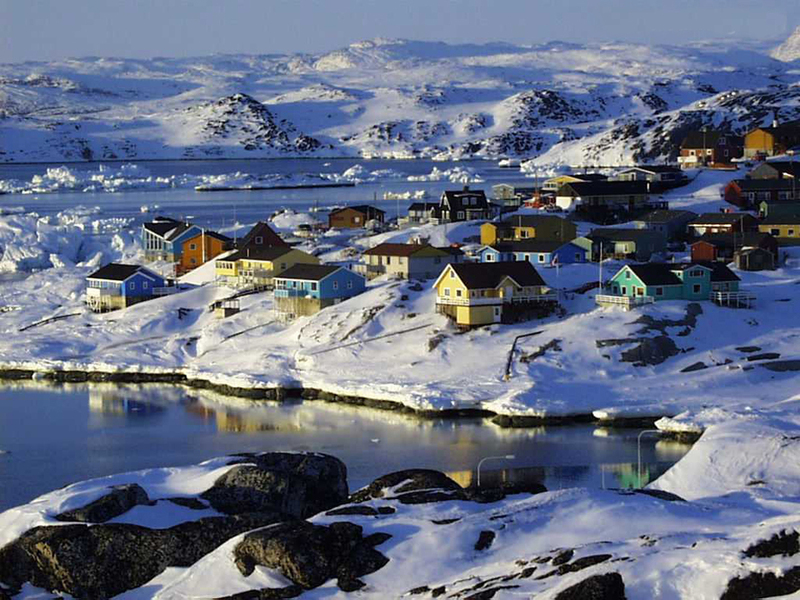 Greenland’s 57,000+ people have high unemployment, alcoholism, AIDS and suicide rates. As a matter of fact the suicide rate in Greenland was about 8 times higher than that in the United States in 2000 and about 7 times higher in 2015. By 1985, suicide was the cause of more deaths in Greenland than cancer. It is estimated that 1 in 5 people in Greenland attempt suicide at least once. Greenland has the highest suicide rate in the world, more than or about twice that of Guyana, North Korea and Sri Lanka; which are said to be the highest among nations. Now, we saw how the father and son, Eric and Leif affected Greenland; but, there is another father and son who affected the country in a greater manner. In July 1721, Evangelical Lutheran missionary Hans Egede of Norway, on behalf of Frederick IV, king of Denmark and Norway, took three ships (including the Haabet ‘the Hope’) carrying his wife and four children and 40 other colonists and sailed to what they name Haabets Colonie (Hope Colony) on the island of Kangeq (Haabets Oe; ‘island of Hope’). Because 85% of Greenland in inhabitable and its average daily temperatures do not exceed 10° C (50° F), most of its population settled in the south and on the coast or coastal islands. In 1722, Hans Egede founded Godthåb, which today is Nuuk – the capital of Greenland. From this colony he preached to the Eskimos (Inuit). They were deep in superstition and illiterate to the Bible. Hans did what he could to learn the language and produce a New Testament; but the terms were hard to come by – as was early on in Japan interpreting the meaning of the Son of God – which many thought more as the Sun created by a God. In 1733, the region was hit with a smallpox epidemic. It is said that some of the Inuit islanders said that Hans and Gertrude were kinder and more loving to them than they were to each other. As a matter of fact, during her charitable and Christian caring, Gertrude (Gertrud) died and in some despair Hans returned to Denmark in 1736. However, the story did not end there; for his son Paul, who was raised among the Eskimos and mastered their language, remained in Greenland, translated the New Testament and preached to the Inuit. Paul (Poul) Hansen Egede, also a botanist, stayed among the Kalaallit Greenlandic Inuit for another six years. In 1742, he was appointed Minister of the Vartov Lutheran Church in Copenhagen, Denmark. In 1n 1747, he was a professor at the Greenland Mission Seminary in Denmark. And in 1779 he became the Bishop of Greenland. Hans and Paul Egede with the help of Arnarsaq, a female Inuit who was converted and baptized in 1737, and three other men, translated the Bible into the Kalaallisut language. Paul also produced a Kalaallisut Catechism in 1756. The work of Hans and Paul Egede and the sacrifices of their family significantly affected religion and Christianity in Greenland. Yet, if should be noted that the Moravians also deeply affected their belief. From about 1733 to 1900, the Moravian United Brotherhood, operating through the Royal Mission College of Copenhagen; the Mission started and worked in conjunction with Hans Egede and was established by King Frederick IV. Part of the support for the Mission came through the General Trade Company allowed by Denmark to have a monopoly on Greenland trade. In 1930, Catholic priests began visiting Greenland and a missionary was founded there; but it was Lutheranism that was the official religion until 1953 when Greenland ceased to be a colony of Denmark. According to the 2016 CIA Factbook, the religion of Greenland is Evangelical Lutheran; and traditional Inuit spiritualism. In 2010, it was said that 95% of the population was Protestant and nearly all Lutheran (a very small percentage are Baptist or another protestant denomination); and that less than 3% were agnostic and 1% Inuit spiritual beliefs. However, other studies show the about 20% to 25% are non-religious. 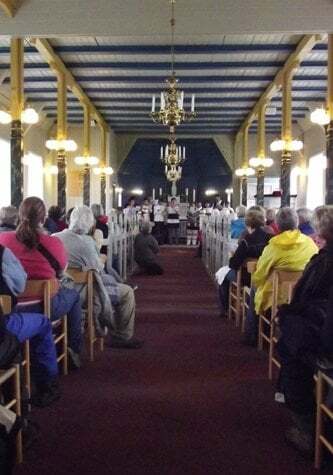 The article states, “Church in Greenland, Kalaallit Nunaanni Ilagiit, received the status of independent dioceses with its own bishop 1 November 1993… Church in Greenland is still a part of the Danish national church… Greenland is divided into three deaneries with 17 parishes…” The Church of Denmark is the Evangelical Lutheran Church. The bishop of Greenland (was called bishop of Garðar) is over an episcopal church in the Lutheran tradition. The current bishop in Sofie Lisbeth Petersen; she is Danish Inuit who was installed in 1995. She was ordained at Hans Egede Church and is the second female to be in that position. About 80 percent of Greenland’s population is of Inuit or mixed Danish-Inuit heritage. And through the vast majority of the population professes to be Christian, traditional Inuit spiritual beliefs are still a part of their culture for many. Some still giving ritualistic thanks to bears and whales.